Charlotte Motor Speedway, formerly Lowe's Motor Speedway, is a motorsports complex located in Concord, North Carolina 13 mi (21 km) from Charlotte. The complex features a 1.5 mi (2.4 km) quad oval track that hosts NASCAR racing including the prestigious Coca-Cola 600 on Memorial Day weekend, the NASCAR All-Star Race, and the Bank of America Roval 400. The speedway was built in 1959 by Bruton Smith and is considered the home track for NASCAR with many race teams located in the Charlotte area. The track is owned and operated by Speedway Motorsports, Inc. (SMI) with Marcus G. Smith (son of Bruton Smith) as track president. Charlotte Motor Speedway was designed and built by Bruton Smith and partner and driver Curtis Turner in 1959. The first World 600 NASCAR race was held at the 1.5 mi (2.4 km) speedway on June 19, 1960. On December 8, 1961, the speedway filed bankruptcy notice. Judge J.B. Craven of US District Court for Western North Carolina reorganized it under Chapter 10 of the Bankruptcy Act; Judge Craven appointed Robert "Red" Robinson as the track's trustee until March 1962. At that point a committee of major stockholders in the speedway was assembled, headed by A.C. Goines and furniture store owner Richard Howard. Goines, Howard, and Robinson worked to secure loans and other monies to keep the speedway afloat. By April 1963 some $750,000 was paid to twenty secured creditors and the track emerged from bankruptcy; Judge Craven appointed Goines as speedway president and Howard as assistant general manager of the speedway, handling its day-to-day operations. By 1964 Howard become the track's general manager, and on June 1, 1967, the speedway's mortgage was paid in full; a public burning of the mortgage was held at the speedway two weeks later. Smith departed from the speedway in 1962 to pursue other business interests, primarily in banking and auto dealerships from his new home of Rockford, IL. He became quite successful and began buying out shares of stock in the speedway. By 1974 Smith was more heavily involved in the speedway, to where Richard Howard by 1975 stated, "I haven't been running the speedway. It's being run from Illinois." In 1975 Smith had become the majority stockholder, regaining control of its day-to-day operations. Smith hired H.A. "Humpy" Wheeler as general manager in October 1975, and on January 29, 1976, Richard Howard resigned as president and GM of the speedway. In the following years, new grandstands and luxury suites were added along with modernized concessions and restrooms to increase the comfort for race fans. Smith Tower, a 135,000 square feet (12,500 m2), seven-story facility was built and connected to the grandstands in 1988. The tower houses the speedway corporate offices, ticket office, gift shop, leased offices and The Speedway Club, an exclusive dining and entertainment facility. The speedway became the first sports facility in America to offer year round living accommodations when 40 condominia were built overlooking turn 1 in 1984, twelve additional condominium units were later added in 1991. In 1995, 26-year-old Russell Phillips was killed in one of the most gruesome crashes in auto racing history. From 1997 to 1999 the track hosted the Indycar Series. On lap 61 of the 1999 race, a crash led to a car losing a tire, which was then propelled into the grandstands by another car. Three spectators were killed and eight others were injured in the incident. The race was canceled shortly after, and the series has not returned to the track since. The incident, along with a similar incident in July 1998 in a Champ Car race at Michigan International Speedway, led to new rules requiring cars to have tethers attached to wheel hubs to prevent tires from breaking away in a crash. Also following the crash, the catch fencing at Charlotte and other SMI owned tracks was raised from 15 feet (4.6 m) high with 3 feet (0.91 m) overhangs to 21 feet (6.4 m) with 6 feet (1.8 m) overhangs to help prevent debris from entering the stands. In 2005, the surface of the track had begun to wear since its last repaving in 1994. [further explanation needed] This resulted in track officials diamond-grinding the track, a process known as levigation, to smooth out bumps that had developed. The ground surface caused considerable tire-wear problems in both of the NASCAR races that year. Both races saw a high number of accidents as a result of tire failure due to the roughness of the surface. In 2006, the track was completely repaved. Track president "Humpy" Wheeler retired following the Coca-Cola 600 on May 25, 2008, and was replaced by Marcus Smith. At the end of 2008, the speedway reduced capacity by 25,000 citing reduced ticket sales. At the same time, the front stretch seats were upgraded from 18 inches (460 mm) fold down seats to 22 inches (560 mm) stadium style seats that were acquired from the recently demolished Charlotte Coliseum. On September 22, 2010, the speedway announced a partnership with Panasonic to install the world's largest high definition video board at the track. The video board measures approximately 200 feet (61 m) wide by 80 feet (24 m) tall, containing over nine million LEDs and is situated between turns 2 and 3 along the track's backstretch. It has since been surpassed in size by the video board at Texas Motor Speedway. The track demolished the Diamond Tower Terrace grandstand on the backstretch in 2014 to reduce the track's seating capacity to 89,000. Charlotte Motor Speedway reduced their seating capacity by 31% due to the continuing lacking attendance. This downfall of attendance has not only been felt at Charlotte Motor Speedway, but all throughout NASCAR, thus causing Daytona International speedway to go through renovations, also reducing seating. On May 20, 2000, fans were crossing a pedestrian bridge from the track to a nearby parking lot after a NASCAR all-star race. An 80-foot (24 m) section of the walkway fell onto a highway in Concord. In total, 107 fans were injured at Lowe's Motor Speedway when the bridge dropped 17 feet (5.2 m) to the ground. Nearly 50 lawsuits against the speedway resulted from the incident, with many being settled out of court. Investigators have said the bridge builder, Tindall Corp., used an improper additive to help the concrete filler at the bridge's center cure faster. The additive contained calcium chloride, which corroded the structure's steel cables and led to the collapse. The incident is considered one of the biggest disasters in NASCAR history. The main quad oval is 1.5 miles (2.4 km) long with turns banked at 24 degrees and the straightaways banked at 5 degrees. Currently, the configuration hosts the Monster Energy NASCAR Cup Series (Monster Energy NASCAR All-Star Race and Coca Cola 600), Xfinity Series (Alsco 300), and Gander Outdoors Truck Series (North Carolina Education Lottery 200). Inside the front stretch is a 0.25 miles (0.40 km) flat oval designed after Bowman-Gray Stadium. The 1/4 Mile track currently hosts the NASCAR Whelen Southern Modified Tour, the Summer Shootout Series and other events such as the Legends Millon. Daniel Suárez testing the "Roval" course in July 2018. Contained within the main oval is a 2.25 miles (3.62 km) road course and a 0.6 miles (0.97 km) Kart course. The autumn race for both the 2018 Monster Energy NASCAR Cup Series and the 2018 NASCAR Xfinity Series took place on the road course, promoted as a "Roval". The final version was announced on January 22, 2018. The new layout, which combines the 1.5-mile oval with the infield road-racing section, removes what was labeled Turn 8 on the original track map. The final version of the circuit will be 2.28 miles (3.67 km) over 17 turns instead of 2.4 miles (3.9 km) over 18 turns, reducing lap times and making the infield section less technical. The zMAX Dragway is a state-of-the-art four-lane drag strip, located on 125 acres (51 ha) of speedway property across U.S. Highway 29 from the main superspeedway. It was built in 2008 involving a total of 1,876 workers and a combined 636,000 man hours. With 300 workers on site daily working an average 11-hour shift, a 13-month construction project turned into a 6-month one. At one point during construction, concern by nearby residents led Concord city council to rezone land the drag strip was being built on, preventing it from being built. Following the decision Smith threatened to close Charlotte Motor Speedway and build a track elsewhere in Metrolina. When asked if he would go through with the threat Smith replied "I am deadly serious". After a month of negotiations, the issue was settled and, instead of the speedway closing, Smith announced $200 million worth of improvements including road and highway improvements, as well as noise attenuation for the drag strip. The drag strip officially opened on August 20, 2008, and a public open house was held a few days later. The first NHRA event was held September 11–14, 2008. The dragway features the first of two all-concrete, four-lane drag strips in the United States. The starting line tower is 34,000 square feet (3,200 m2) and includes 16 luxury suites, race control areas and a press box. Two grandstands, one on either side of the strip, can hold a combined 30,000 spectators. Twenty-four luxury suites with hospitality accommodations are located above the main grandstand. Two tunnels run underneath the strip to enhance fan mobility between the two grandstands. The Dirt Track at Charlotte is a 1,300 ft (400 m) clay oval located across Highway 29 from the quad-oval speedway. The stadium-style facility, built in 2000, has nearly 14,000 seats and plays host to Dirt Late Models, Modifieds, Sprint Cars, Monster Trucks and the prestigious World of Outlaws World Finals. In 2013, the track hosted the Global Rallycross Round 8. Since 2013, the annual Carolina Rebellion hard rock and heavy metal festival concert on the first weekend in May has been held at the Rock City Campgrounds located at the speedway. Bands such as Avenged Sevenfold, Kid Rock, Deftones, Disturbed, ZZ Top, Halestorm, Sevendust, Anthrax. Five Finger Death Punch, and All That Remains have played at Carolina Rebellion. The event was extended to three-day format in 2016, with 80,000 in attendance. During the mid-1980s, there was a plan to build a football stadium on the frontstretch of the track with the goal of luring either an NFL or USFL team. The stadium would have held 76,000 and had temporary stands at both endzones and grandstand seating behind pitroad that could have been lowered on hydraulic lifts for races and cost $12 million. There were two interested parties in bringing a professional football franchise to Charlotte, businessman George Shinn and Smith. By 1984, Shinn was in the running for a USFL franchise for Charlotte that would have played in the proposed stadium. In mid-March 1985, Bruton Smith announced that Charlotte Motor Speedway was in the market for an NFL team. After Smith demanded that the city of Charlotte pay for the project the plan collapsed. Shinn eventually landed the NBA Charlotte Hornets and the NFL came to town in the form of the Carolina Panthers; however, the Panthers owner Jerry Richardson would build his own stadium in Charlotte. ^ a b c d e f "Speedway History". Charlotte Motor Speedway. Archived from the original on 2012-01-15. Retrieved 2015-11-12. ^ "Fatal Crash Prompts IRL Action". CBS News. CBS Interactive. Associated Press. May 18, 1999. Retrieved November 25, 2010. ^ Newton, David (January 23, 2010). "Standing room only? Not these days". ESPN.com. Concord, North Carolina: ESPN Internet Ventures. Retrieved April 29, 2010. ^ Long, Dustin (January 5, 2010). "New name for a track, new drivers and some rule changes". The Virginian-Pilot. Landmark Media Enterprises. Retrieved April 29, 2010. ^ Bowles, Tom (March 5, 2010). "Hard choices ahead if Kentucky Speedway joins Sprint Cup circuit". Sports Illustrated. Time Inc. Archived from the original on March 8, 2010. Retrieved April 29, 2010. ^ "NASCAR promoter Humpy Wheeler to retire after Coca-Cola 600". Autoweek.com. Crain Communications. May 20, 2008. Retrieved April 29, 2010. ^ "TV is 30 percent larger than Cowboys'". ESPN.com. ESPN Internet Ventures. March 31, 2011. Retrieved October 14, 2015. ^ "Charlotte Motor Speedway and Panasonic Announce World's Largest HD Video Board". 2010-09-22. Archived from the original on 2010-09-24. Retrieved 2010-09-22. ^ News, A. B. C. "ABC Sports News". ABC News. Retrieved 2 January 2019. ^ "SRLY". SRLY. Retrieved 2 January 2019. ^ Pockrass, Bob (December 11, 2014). "Tracks continue removing seats; how it could impact fans". Sporting News. Retrieved May 29, 2016. ^ a b Fryer, Jenna (July 5, 2006). "Judge rules against fans in Lowe's bridge collapse". ESPN News Services. Raleigh, North Carolina: ESPN Internet Ventures. Associated Press. Retrieved October 14, 2015. ^ a b Boudin, Michelle (July 30, 2010). "10 years after NASCAR bridge collapse, injured man changing lives". WCNC-TV. Charlotte, North Carolina: Tegna, Inc. Archived from the original on March 9, 2012. Retrieved July 30, 2010. ^ Albert, Zack (January 22, 2018). "Charlotte Motor Speedway introduces final road-course layout". nascar.com. NASCAR. Retrieved 30 September 2018. ^ a b "Lots of love (and $80M) keeps track in Concord". nascar.com. 2007-11-27. Retrieved 2010-04-29. ^ "zMAX Dragway – A Year in Review". Charlottemotorspeedway.com. Archived from the original on 2011-07-23. Retrieved 25 November 2010. ^ "zMAX Dragway @ Concord Fast Facts". zmax.com. Archived from the original on 2011-07-18. Retrieved 25 November 2010. ^ "Dirt Track". Charlotte Motor Speedway. Archived from the original on 2013-04-14. Retrieved 2013-07-18. ^ "Stadium Super Trucks Added to TORC Charlotte Race". Off-Road. August 9, 2016. Retrieved August 11, 2016. ^ Charlotte Motor Speedway - Races Tracks - Richard Petty Driving Experience. Drivepetty.com. Retrieved on 2013-07-18. ^ Smith, Shannon (October 3, 2012). "'American Idol' auditions: day two in Charlotte". Tribune Broadcasting. Retrieved June 17, 2015 – via WGHP. ^ "Carolina Rebellion to bring three days of rock". The News Herald. March 28, 2016. Retrieved May 30, 2016. ^ "Historical Motorsports Stories: Football at Charlotte Motor Speedway - Racing-Reference.info". racing-reference.info. Retrieved 2018-02-04. ^ "Race Results at Charlotte Motor Speedway". Racingreference.info. Retrieved 25 November 2010. ^ Glenday, Craig (2014). Guinness World Records 2014. 2013 Guinness World Records Limited. p. 171. ISBN 978-1-908843-15-9. 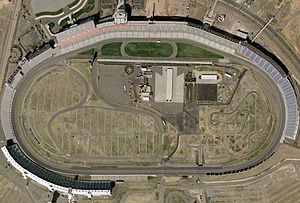 Wikimedia Commons has media related to Charlotte Motor Speedway.